Building your home business has just become easier with eLearning. Spend the next 12 weeks in the comfort of your home learning how to build your own eBusiness while investing a few hours a week! I'll bet you don't even realize how lucky you are. If you've been sitting on the fence about taking the e-Learning course now is the time to jump into your own amazing business. SBI just launched an ammazing opportunity for you. You can now pay for this once-in-a-lifetime opportunity in 3 easy payments. In 3 short months you'll not only have your course paid for, you'll have your business started and on it's way to earning you an income for life. I started building my eBusiness in 2005, I had no experience building a website or any special computer training to give me an inch of a head start. I would have given anything to be able to pay someone to take me by the hand and guide me through the eLearning 12 week process. Now don't' get me wrong, through trial and error along with my Irish stubbornness and determination I finally started figuring things out. What I couldn't figure out on my own, I found help in the forum and SBI's wonderful support system. When I think of the time I would have saved to have this opportunity with eLearning, I honestly can't understand why anybody would hesitate. Through eLearning you'll have an experienced SBI Webmaster, someone that has already been there and done all the things that you're going to ask questions about. They'll walk you through each day and give you assignments for the week. You'll work at your own pace and produce all the key elements to the SBI formula for successful eBusiness you can call your own. All you really need is the passion to succeed. You'll have access to other eLearners that you'll build a relationship with, kind of an Alumni group that you can compare notes, share little tips and tricks that will save you so much time and frustration and most important you'll always have someone to share your success with. Before you know it you'll be giving each other cyber high-fives! Once you graduate after this amazing 12 week course you won't be handed a piece of paper that says go out in the world now and find a job. Oh no, you'll have a unique home business that you created from scratch! And you'll do all this in your spare time from home! Yes, you will pay a little more than just buying your website from SBI, but time really is money and the time you'll save in those 12 weeks will pay you back many times over for your original investment. 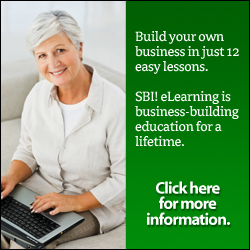 Do you know that this same SBI eLearning course is being offered in many of the top universities world wide? Hey, don't laugh at that photo above, I can remember sitting on a telephone stand talking to my friends on a party line on a phone like that. It just goes to show how far technology has advanced over my lifetime. The computer you're working on today will someday look like that black phone. The real secret is, now is the time to learn this technology and get your website built, get in on the ground floor while you still have the opportunity to learn and build a business that you created from scratch. Now let me guess what could possibly be stopping you from signing up for the eLearning opportunity. I'm not an expert at anything, how can I build an eBusiness? I don't have anything to sell, how would I make money? Did I just read your mind? Not really, I get email all the time from people that would just love to do what I'm doing to make a living or at least enjoy a second income. There are times in life we just have to step outside that little comfort box of ours to find out what we are capable of doing. I just heard on the news a few weeks ago that dot com's are running out fast. The world is turning to the latest technology, just imagine when the people in China and India are able to buy their own computers and start building their own websites. Can you imagine what your website will be worth in a few years? Talk about a safe investment! Now that e-Learning is here there is absolutely no excuse to let this opportunity pass you by. Believe me, you only regret in life not trying to live your dreams!. Why You Should Create a Home Business Now! Are you thinking about retiring soon, like Grandma? 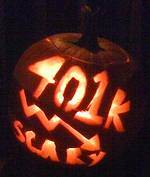 Have you checked into social security or your 401K lately? Did you remember to have a brown paper bag handy to breath into? You're not alone if you've looked at your 401K lately and wondered where on earth the money you've been saving has gone. Even though my husband and I have been saving what we could over the years and have already lost half of what we've saved we still consider ourselves lucky. Yet, with all the news of the economy problems, the horrible swindlers that stole billions from innocent people and the projection of hard times to come, nothing shocked me more than walking into the Social Security Office a couple of weeks ago and finding out what income I can expect from Social Security after paying into the system for over 40 years. I assumed all the money I paid into Social Security was just sitting there waiting until I retired. I never realized because I had to stop working a little over 6 years ago that it would send me into poverty level once I reach retirement age. Believe me, I'm not being dramatic. My SS check won't even equal what people get on welfare! There isn't a day that goes by that I don't thank God that I found Solo Build It back in 2005, especially now that I'm looking at my retirement and know that with what I will be getting from Social Security I better have a backup plan. This isn't just about people looking at retirement. It's about security, pride in what you're doing, passion and following your dreams. Excuses just don't cut it anymore. If you need that little extra help, someone to show you step by step how to create, develop and build your dream, than eLearning is what I highly recommend. It's time for all of us to wakeup, nobody is going to take care of us, all we really can depend on in life is ourselves. So do something about it, today!